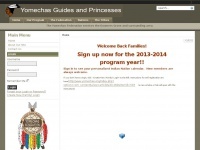 The Yomechas Indian Guides & Princesses Federation serves Downers Grove, Lisle, Naperville, Woodridge, Lemont, Westmont, Darien, Hinsdale, Clarendon Hills, Oak Brook, Burr Ridge, Willowbrook and parts of several other Chicago Illinois area villages. Members may live in any town, village or unincorporated area. The websites creator or author is Registration Systems Incorporated. A profile of Yomechas.org was found on the social network Facebook. The web server used by Yomechas.org is run by ColoCrossing and is located in Buffalo, USA. The server runs exclusively the website Yomechas.org. The Yomechas.org websites were developed using the programming language PHP and served by a Microsoft-IIS server. The website uses the latest markup standard HTML 5. The website does not specify details about the inclusion of its content in search engines. For this reason the content will be included by search engines.